Events & tastings | The Old Cheese Shop of St Andrews | The Old Cheese Shop of St Andrews is a small specialist cheesemonger with a big passion for cheese based in St Andrews, Fife, Scotland. First Tasting of the Year! Join us for our first Cheese & Wine Tasting of the year which will take place on Saturday 27th February at 7pm at our shop. 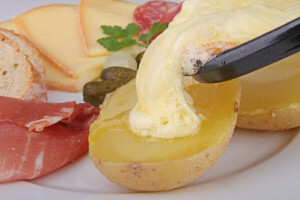 The theme will be German Wines and we will be sampling 5 delicious cheeses and 5 unique wines. Tickets are selling fast – early booking is strongly advised! 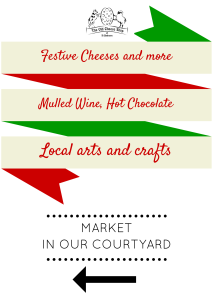 This Suturday December 12th we are organising a Christmas Market in our courtyard from 12pm. 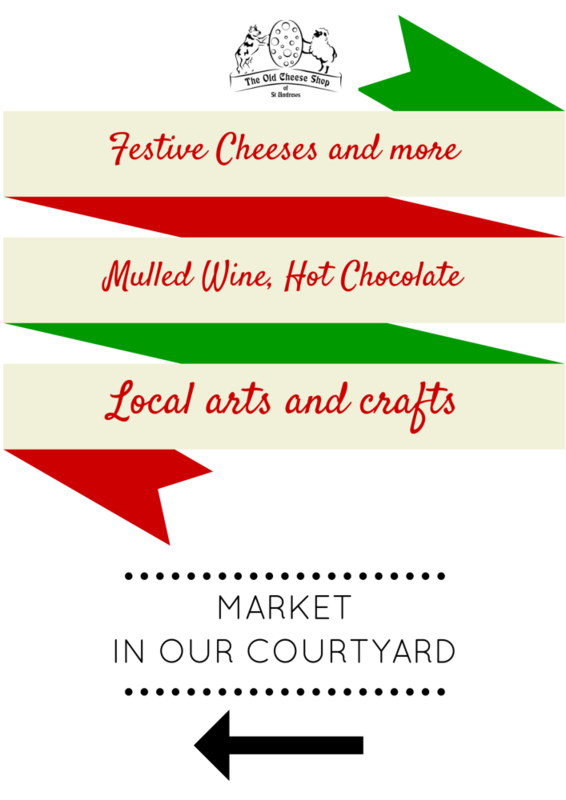 There will be mince pies and mulled wine, hot toddies lux and melting paninis for you to enjoy and share with your friends and family in our festive courtyard. Exciting cheeses and Christmas gifts for everyone to stock up – we hope you can join us! 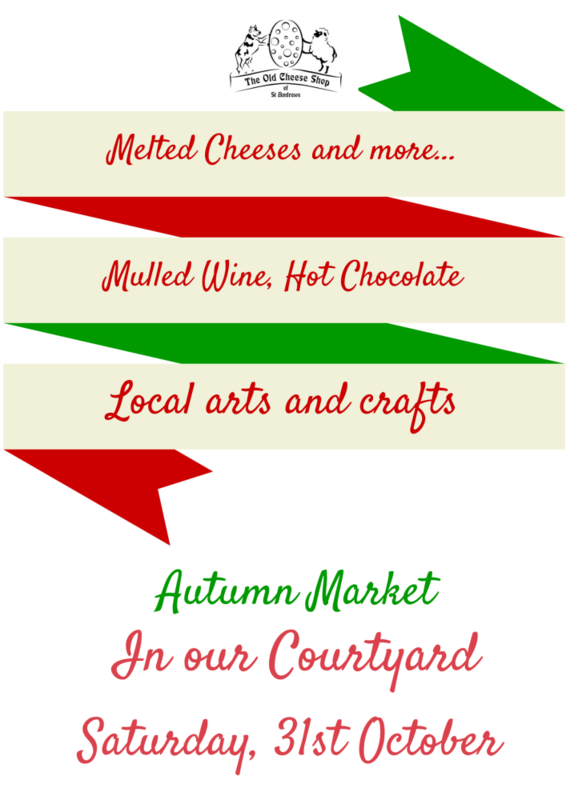 Join us for the Autumn Market in our courtyard this Saturday 31st October 12-5pm. We will be serving Melted Cheeses, Mulled Wine, Hot Chocolate and more. We will also have stalls with local artists selling their art, so come to support them and get some beautiful handmade gifts. 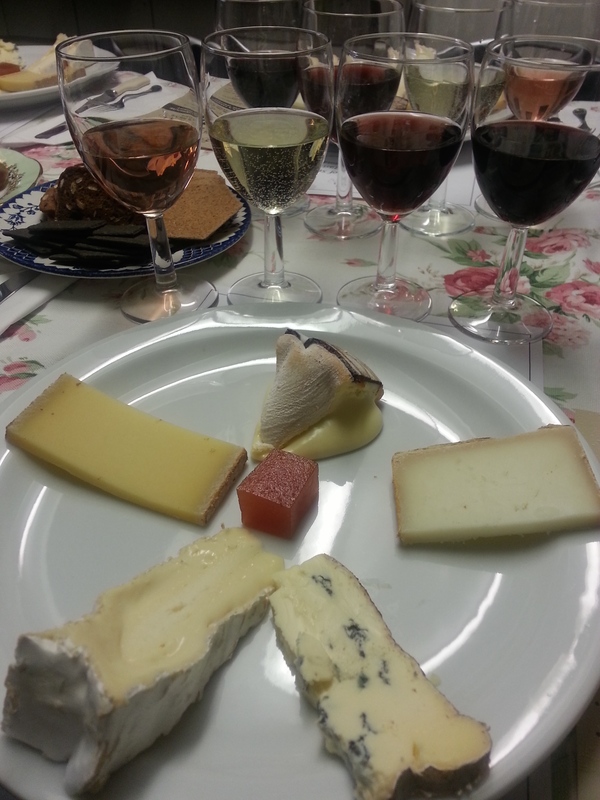 Join us for our next Cheese & Wine Tasting which will take place on Friday 20th November at 7pm at our shop. The theme will be Red Wine & Cheese and we will be sampling 5 delicious cheeses and 5 unique red wines. Tickets are selling fast – early booking is strongly advised! We are now fully booked for this event, join us next month! Join us for our next Cheese & Wine Tasting which will take place on Friday October 23rd at 7pm at our shop. We will be sampling 5 delicious cheeses and 5 unique wines. Tickets are selling fast – early booking is strongly advised! Join us for our next Cheese & Wine Tasting which will take place on Friday May 15th at 7pm. The theme will be Amazing New World, and we will be sampling 5 delicious cheeses and 5 unique wines, with Peter Woods from St Andrews Wine Co. Tickets are selling fast – early booking is strongly advised!